GOLD COAST, Australia – World No. 7 Canada and No. 14 Australia are matching up their prospective U-18 National Teams in an eight-game series running from 17-24 August at Surfers Paradise Baseball Field. The Australian and Canadian U-18 National Team coaching staffs will use the series to finalise their elite 20-player rosters that will compete for the world championship at the XXVII WBSC U-18 Baseball World Cup 2015 to be staged from 28 August to 6 September in Osaka, Japan, with the semi-finals and finals to be staged at historic Hanshin "Koshien" Stadium. Australia is currently carrying a 28-player expanded roster, while Canada has 24 hopefuls vying to represent the Maple Leaf. Canada has already announced its U-18 squad will feature the 12th overall pick of the 2015 Major League Baseball draft, first baseman Josh Naylor. Australia will take on No. 11 Mexico to open the U-18 Baseball World Cup on 28 August, while Canada will open with No. 4 Chinese Taipei. Both Canada and Australia have proven their U-18 National Teams are a threat on the world stage. In 2012, Canada finished second in the world, taking the silver medal at the WBSC U-18 Baseball World Cup in Seoul, S. Korea. At the 2010 WBSC U-18 Baseball World Cup in Thunder Bay (Canada), the Aussies stormed to a second-place finish, claiming the silver. 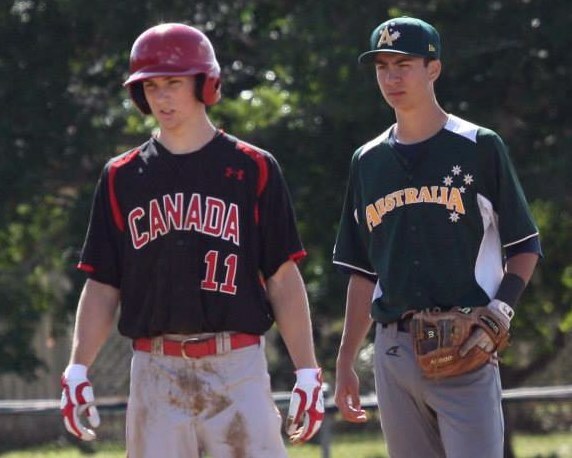 At the last WBSC U-18 Baseball World Cup in Taichung, Taiwan in 2013, Canada and Australia finished 7th and 8th, respectively. Australia won the first-ever Baseball Confederation of Oceania (BCO) U-18 Championship/2015 U-18 Baseball World Cup Qualifier this past January to earn a place in Osaka. Canada finished third at the 2014 Pan American Baseball Confederation (COPABE) Americas U-18 Championship/2015 U-18 Baseball World Cup Qualifer to be included among the twelve nations shooting for the world title Osaka.